Beds and headboards finish off a perfect bedroom furniture set. Let Home Xpressions help to transform your bedroom into a place you can rejuvenate and relax. Our showroom has a large variety of bedroom sets including mattresses, beds, headboards, footboards, and bedding. We have a wide range of bedroom furniture design styles including rustic, log, barnwood, traditional and casual. Rest and relaxation are just a visit away! Home Xpressions is a leader in Barnwood Furniture, which is an excellent option for beautiful headboards, foot boards, dressers and bedside tables. Please visit our Barnwood Furniture page for more details. Home Xpressions is now an authorized dealer for Woodland Creek Furniture! Woodland Creek has been handcrafting rustic and log furniture, distinct interior décor, and more for over 18 years. Their furniture is made by artisans who bring a balance of elegance, form, and function to each piece. 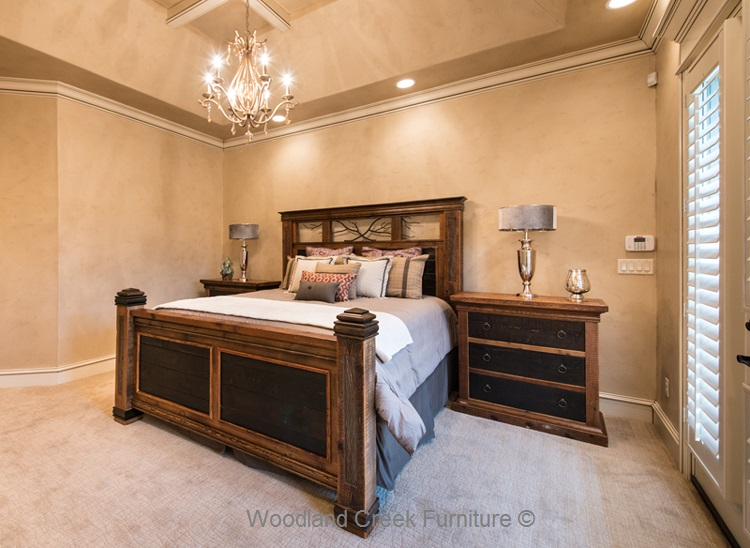 Here’s the best part – 99% of Woodland Creek’s furniture designs can be made in custom sizes and layouts. Why? Because they are the manufacturer! Home Xpressions customers can now search over 5,000 unique products. Customers have two delivery options. First, your order can ship directly to your door from Woodland Creek’s factory. Or, your order can ship directly to the Home Xpression’s warehouse where white glove delivery is made using our trucks and people*. Woodland Creek has two distinct web sites. WoodlandCreekFurniture.com features current trends including rustic, organic, reclaimed, industrial, live edge, soft modern, and lodge. Popular home improvement shows are mixing rustic with modern, reclaimed with industrial, traditional with organic – it seems the more eclectic the mix, the better the results and reactions. Woodland Creek has many popular exclusive designs. Woodland Creek’s LogFurniturePlace.com website is the place to go for the Northwood’s lifestyle. Here you will discover the largest collection of quality log and rustic furniture in the marketplace. And, best of all they have a high quality, low-price guarantee! Woodland Creek never cuts corners and has a solid reputation for craftsmanship and value.